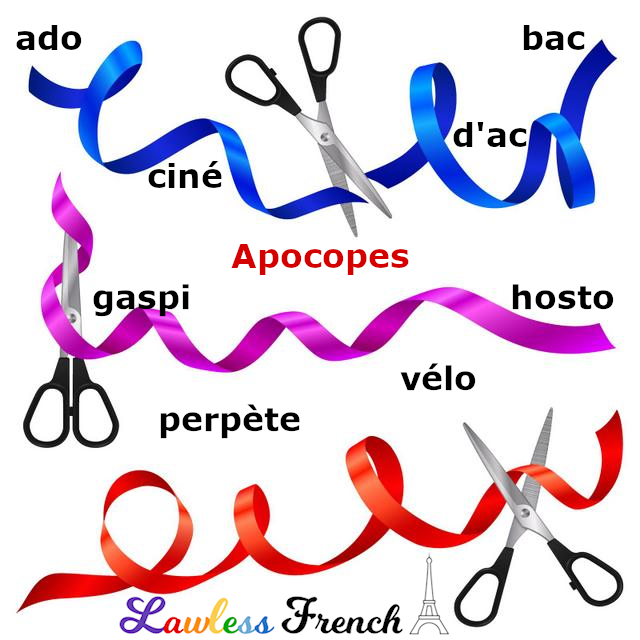 Many French nouns and adjectives have shortened forms called apocopes, which are created by dropping one or more syllables at the end of the word. Some of these are further modified by adding an "o" to the end. Don’t miss the grammar note below the list. Words created by dropping syllables at the beginning of the word are called aphereses. la gym (inf) la gymnastique gym, P.E. la sono (inf) sonorisation sound system, P.A. Unlike the vast majority of French adjectives, apocoped adjectives are invariable.